Students in the new "Coding for Kids" course attend the program's opening ceremony in Kuwait City, along with representatives from Boeing and AMIDEAST. 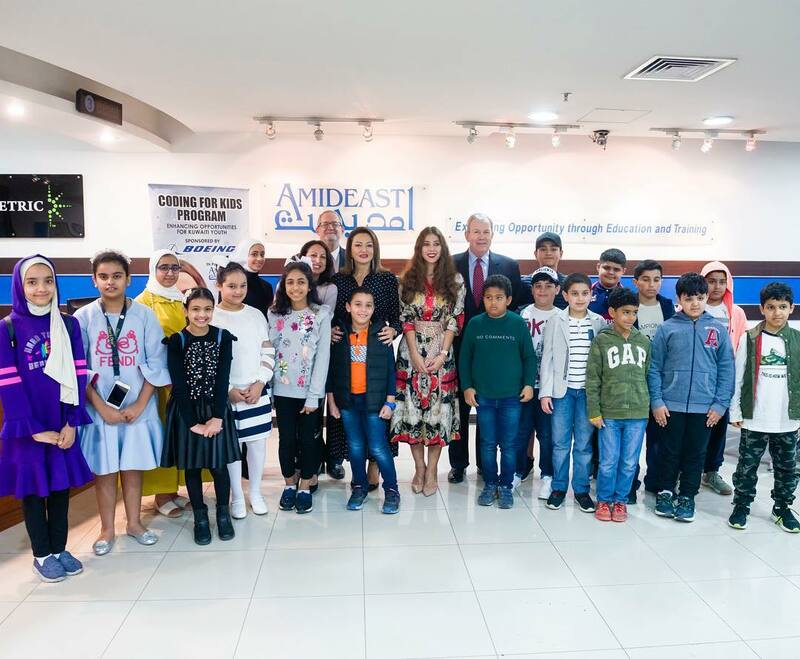 AMIDEAST is pleased to join with U.S. aerospace company Boeing to launch a new program entitled, “Coding for Kids,” to teach young learners in Kuwait to code. The program will engage 24 Kuwaiti students between the ages of 8 and 15, teaching them to design and code interactive games, stories, and animations using the multilingual Scratch, a web-based visual programming language. With ‘Coding for Kids,’ Boeing and AMIDEAST aim to foster innovation and creativity, as well as demonstrate the value of STEM subjects to Kuwaiti youth in line with the 2035 target of Kuwait National Development Plan. By using a technology platform that engages young students, the program will help them build new skill sets to better prepare them for a future in a rapidly changing global environment. Using Scratch, the students will be tasked with designing and creating an interactive story to see how coding works and what the end product can look like. By designing interactive stories and collaborating in small groups, the students will have the chance to see how dynamic teams and technology work hand-in-hand. The students will then have the chance to showcase and present their end products. “AMIDEAST is proud to continue its partnership with Boeing. The Coding for Kids program will provide students with the opportunity to build their cognitive capacity in critical thinking, problem solving and creativity. Thanks to the wonderful support provided by Boeing, these participants will benefit from a unique training initiative that will have a long-term, positive impact on them,” said Samar Khleif, Country Director for AMIDEAST. Boeing is the world's largest aerospace company and leading manufacturer of commercial jetliners and defence, space and security systems, with more than 165,000 employees in 70 countries. For more information, please visit the Boeing website: www.boeing.com.